Are you looking for a bit of gluten free heaven in Melbourne and Brisbane? 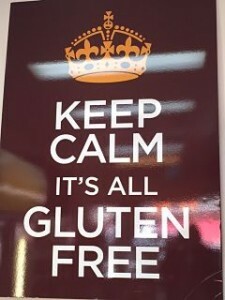 Then you need to visit the dedicated gluten free bakery Gluten Free 4U and you will be like a kid in a candy shop! They have a created a huge range of baked goods and breads that you will not believe are gluten free. There are also options for dairy free, yeast free, egg free, low FODMAP etc. Missing a baguette? A pie? 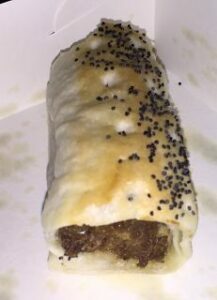 A danish or slice? You will find all of these and more! They also have a small range of grab & go lunch items that are pre-heated (eg pie, sausage roll, mini quiche). Most of the stores do not have a cafe attached, so it is takeaway only. If you are not able to visit in person, you can also order online or via phone for delivery in the metropolitan area. This post barely scratches the surface of what is available, but will hopefully whet your appetite. 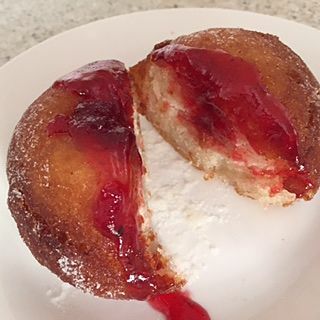 I am starting with doughnuts, as doughnuts regularly come up as something coeliacs desperately miss. How many times have you walked past the amazing smell of a doughnut van at a show or seen a Crispy Creme box turn up at work and you just watch on with envy? For me, both the cinnamon and the jam doughnuts give me that feeling of being a kid at Moomba. The cinnamon doughnuts photo shows them in their bag – they went straight from there into my mouth :-). 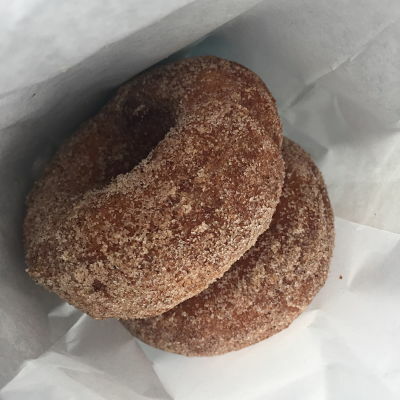 The iced doughnuts are also good, but for me nothing beats the cinnamon and sugar. 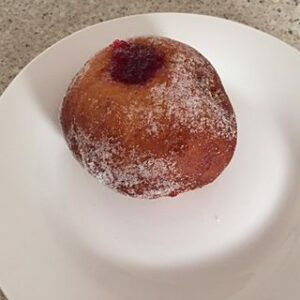 The jam doughnuts need a zap in the microwave so the jam is nice and hot and gooey! 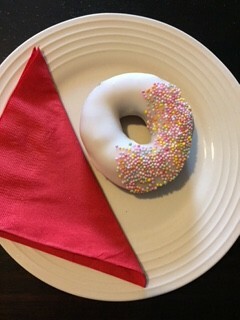 As amazing as the doughnuts are, for me the best thing to come out of Gluten Free 4U is their vanilla slices! I absolutely love, love, love vanilla slices and they taste exactly as I remember them. There is also a dairy free/egg free variety. 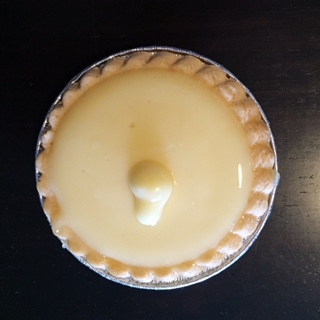 Whenever I am there, I also usually buy a treat for my non GF husband and below is the lemon tart that recently got the tick of approval. For those missing pastries, there are a selection of danishes and other French items like croissants and chocolate croissants (pain au chocolat) and they do taste like light pastry! 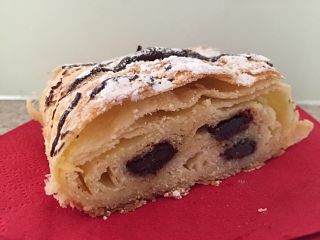 The chocolate croissant is nice ‘as is’, but I really enjoyed the half I put in the microwave to melt the chocolate. 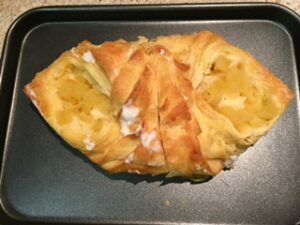 The danishes are large and big enough to share. As an easy dessert, I have bought a variety of danishes and warmed them slightly through in the oven before halving and serving. 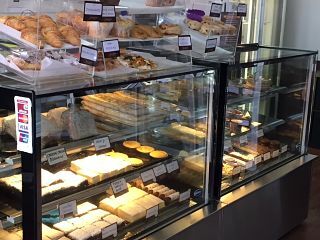 There are plenty of other sweet treats to choose from and if you are from overseas don’t forget to try a lamington :-). If you have a special occasion coming up, you can also order celebration cakes. 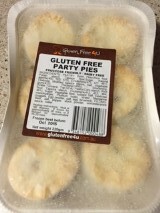 You can see the full range and prices at Gluten Free 4U. 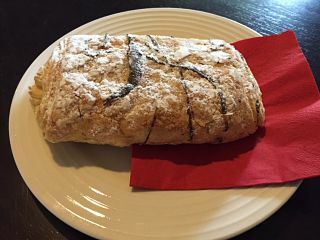 As well as the cakes, there is a wide variety of breads (loaves, rolls etc.) and savoury options. My favourite savoury option is the mushroom and fetta quiche but unfortunately this flavour is not routinely made anymore. 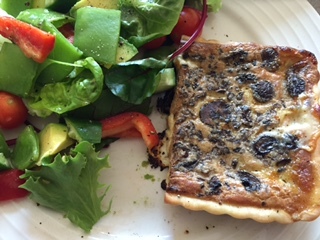 Quiches are available as an individual serve or as a rectangle family size (which cuts into four good size portions for a meal with some salad). 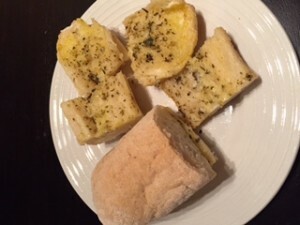 There is also pre-prepared garlic bread if you would like to add that as a side dish. Garlic bread is a real treat for a coeliac! 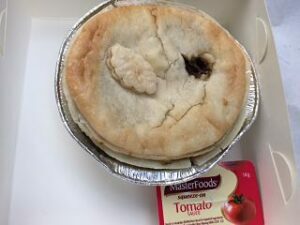 You will also find a good range of frozen pies and sausage rolls (including party size) and many other items in the freezers, such as ready meals, dim sims, ravioli and gnocchi etc. If you need a lunch on the run, you can buy a warm pie, sausage roll or quiche. 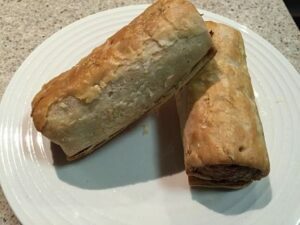 The sausage rolls above are the fructose friendly carrot ones, and the one below is meat with onion. 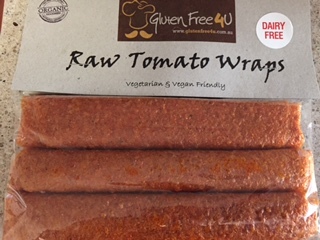 I have also tried these raw vegan wraps – they taste just like the fruit flats/wraps you have probably had before, but a savoury version. They have a long shelf life and are a good packed lunch option. It is a good idea to follow Gluten Free 4U on Facebook so you can see their latest creations. Note: I have no association with Gluten Free 4U and purchased all food reviewed. All stores closed on Sunday, Monday and Public Holidays. If you travel, the London 100% gluten free post might also be of interest! Any chance you may open up a bakery in the north preferably Reservoir area? 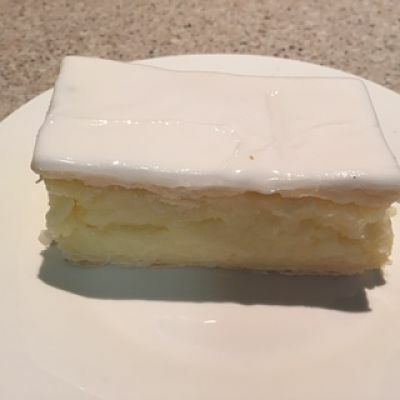 Hi Arijana – I don’t have an association with the bakery so it would be best to contact them via their website! I’m sure it helps them to know where stores are needed.